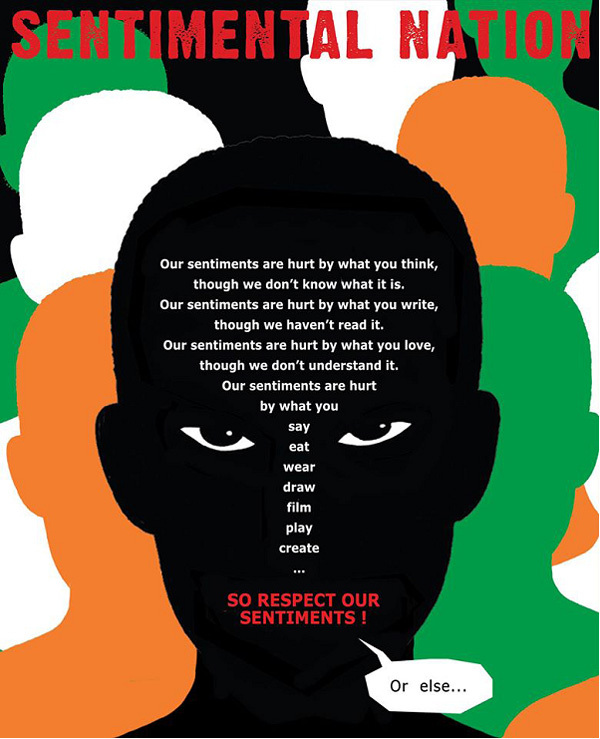 The conversation about intolerance and pluralism may have hit drawing rooms in the past few weeks but for graphic artist Orijit Sen, it has been all-consuming for over a year-and-half. It started as a reaction to Penguin's decision to pulp Wendy Doniger's book on Hindus, and let to a series of over 50 cartoons through which Sen expresses his angst against the muzzling of free speech. "That was the immediate trigger. It set me thinking. I realised that the pulping of the book was symbolic. We had succumbed to the intolerant fascist forces and it served their objective," he says. He is happy that people who didn't speak out earlier because they were beneficiaries of the Modi government's largesse have also decided to join the movement. Sen's cartoons were first curated by eminent writer Githa Hariharan. But his anguish is not limited to one political dispensation; he calls out leaders on all sides of the political divide for what he sees as their attacks on freedom, on tolerance, on rationality, on plurality. He's used social media to share his work, and trolls have naturally followed. "I face abuse online. I have never faced any physical threat." So far. Is he scared now because his cartoons are so unambiguous in their messaging? "I am afraid like anyone else. Kalburgi paid the ultimate price. I am privileged - Hindu, male, upper caste. If I do not speak out, who will? It is my responsibility." This isn't a planned series, though; these are 'off-the-cuff' responses to what's in the news. "I take about an hour on average to make a cartoon and put them out on social media, mostly Facebook." He's now readying to publish them, but won't reveal the publisher. "Obviously it is not Penguin," he chuckles. Here, a selection of Sen's most provocative and insightful works in his own words. "I drew it the same day Prime Minister Narendra Modi's sartorial sense became the talk of the town during US President Barack Obama's visit. 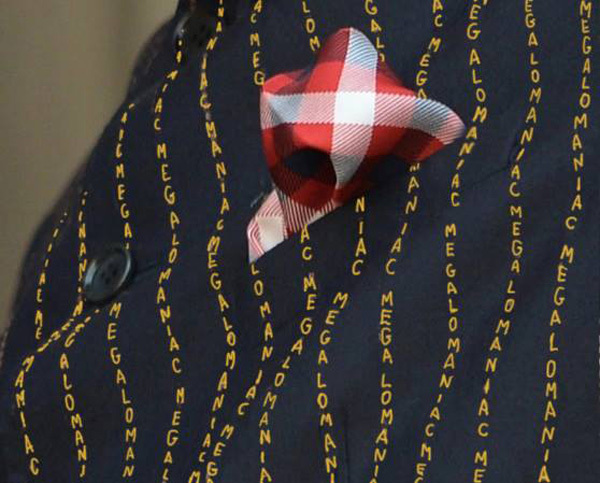 He was wearing the suit with his name embossed on it. I was both disgusted and amused. Any prime minister presenting himself in that manner is absurd." "I made this when Dinanath Batra forced the pulping of Wendy Doniger's book on Hindus. George Orwell's Nineteen Eighty Four was on my mind. Hence the badge of 'Thought Police', and the punchline is a take on "You look like you've had a bit too much to drink". "Sentimental - it's a word we use often without understanding its meaning. I first thought about this when the depiction of Sikhs in a film hurt their 'sentiments'. Even though being sentimental is a personal and private experience, the word is often employed to conveying the opposite - we use it in a public and violent context. That's hardly sentimental." 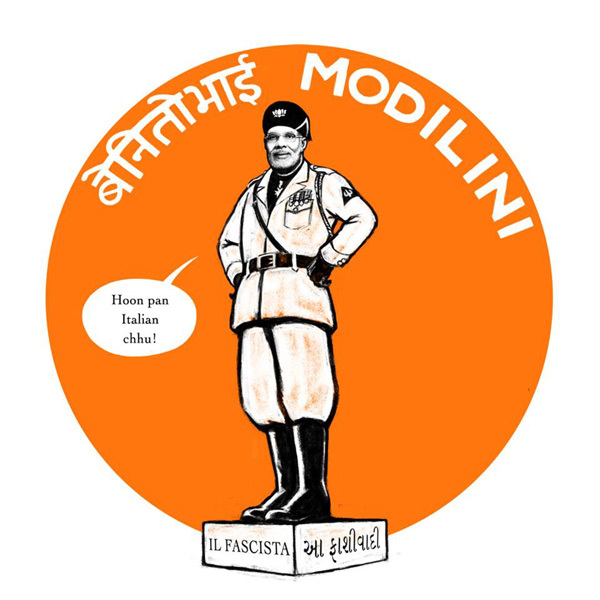 "Modi marked his one year in office with an address to the Indian community in China and claimed that previously Indians had felt ashamed of being born Indian, and that he had changed that in one year. Such a statement can only come from a place of insecurity." "This is from a series I have done on khakhi shorts. 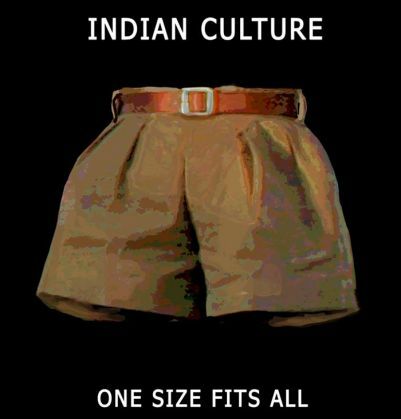 It is ironic that a British uniform has been adopted to portray Indian culture. It is a potent visual symbol. This inanity can be exposed only through graphic and comic content. 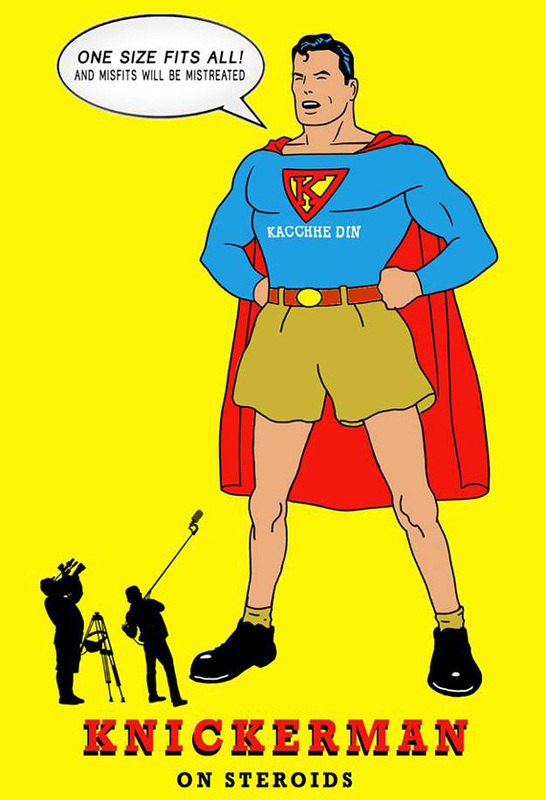 The Knickerman is wearing a 'K' symbol, with 'Kachche Din' stamped on it. The chest is puffed up on steroids, but the lower half is skinny. That is reality." "This one is self-explanatory. The cameraman, the only one not wearing the mask, is like RK Laxman's Common Man. He is looking at the donkey faces questioningly. The cameraman also repudiates the view that the whole of India wants Modi. 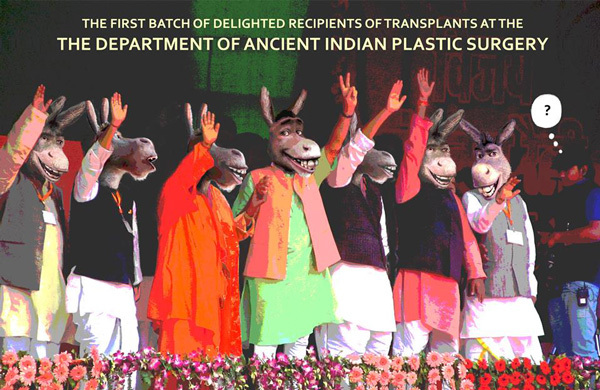 Donkey faces were used because the expression was right, so no disrespect to donkeys." 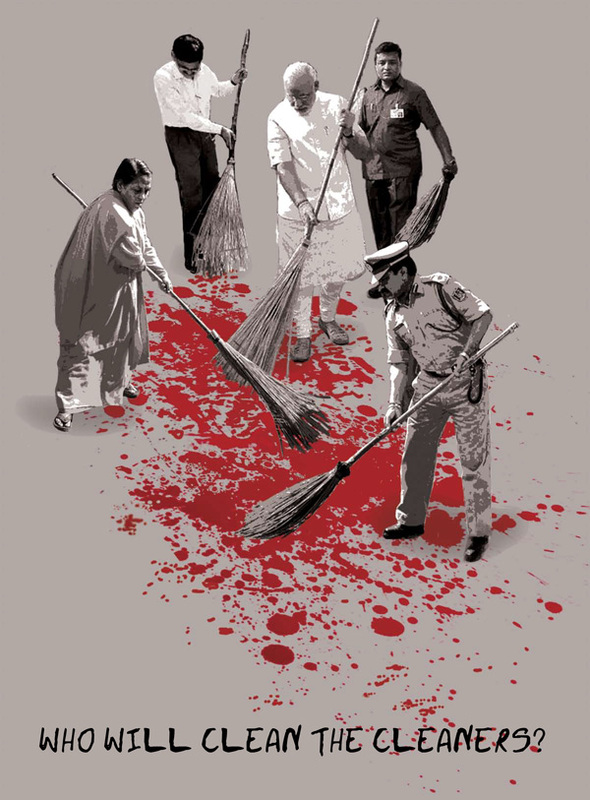 "I drew a few cartoons to mark the 40th anniversary of the imposition of Emergency by Indira Gandhi. 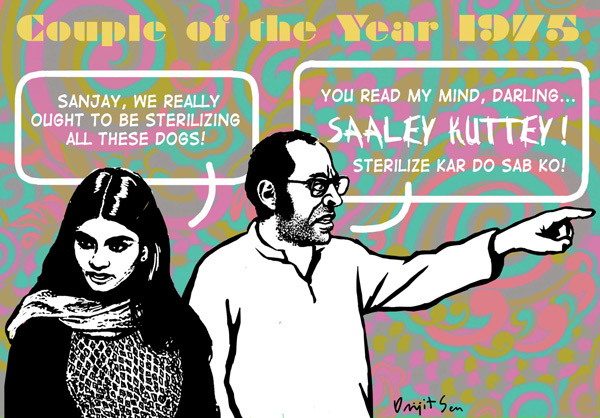 It struck me that both Sanjay and Maneka were obsessed with sterilisation. One batting for humans, the other for dogs. I have tried to capture the fashionableness of the couple and the 70s atmosphere. The expression is important, with Maneka looking down at the dog with compassion and Sanjay looking out of the frame almost snarling." "This is a part of a series on impostors. I have drawn both people I admire and those who were monsters. I compare Mrs G to Medusa. In Greek mythology Medusa was a monster, generally described as having the face of a hideous human female with living venomous snakes in place of hair. 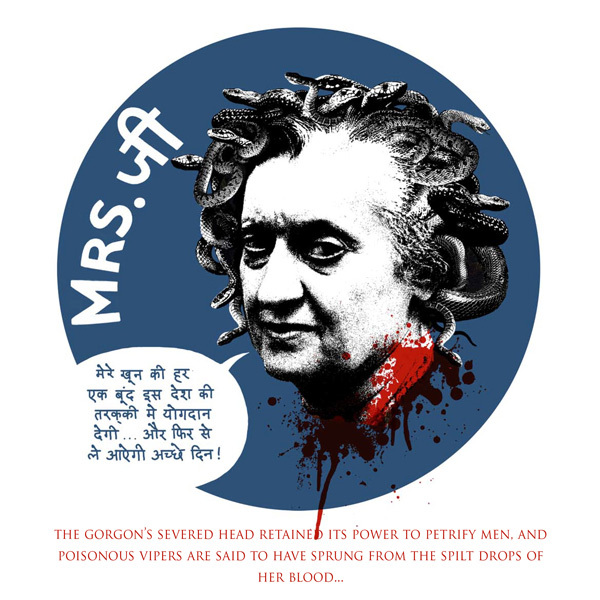 Indira Gandhi reminds me of Medusa and her supposed last words, 'every drop of my blood will contribute to the growth of this nation', reminds of me vipers. She is one of the originators of the kind of divisive politics which we are feeling the brunt of today." "I drew this before Modi was elected Prime Minister. He often took jibes at Sonia Gandhi and her Italian connection. I thought he, too, had a strong Italian connection. He was like Mussolini, the first fascist." "We all say 'have a nice day' without really meaning it in this corporate-sponsored world. You buy a pizza and the guy will say 'have a nice day'. It is the most meaningless, banal line. 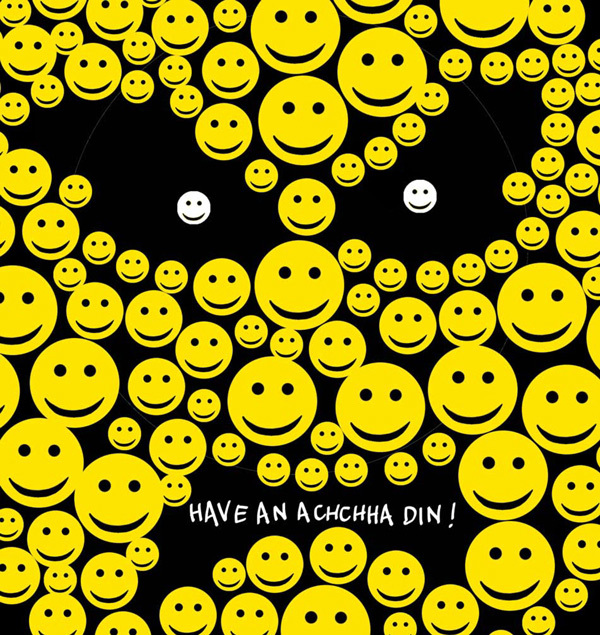 Smileys are a mask we wear. And 'Achche Din' translates to 'have a nice day'." "This was drawn in support of FTII students. In the Mahabharata, Yudhishtra never lied - and yet, when it mattered most he told a lie. I wonder if someone who played Ravana or Duryodhana would be rewarded with a similar position as FTII director. Probably not. Will the FTII director tell the truth? Obviously not." "I made this when PM Modi inaugurated the Swachch Bharat Abhiyan. There is Modi, a cop, Uma Bharti and a bureaucrat. They are part of a system that collaborates. All are equally responsible for the blood of people that is spilled. This is one of the most straightforward cartoons that I have drawn." This is also part of the khakhi shorts series. The khakhi uniform expounds uniformity of culture. One voice, one religion, one culture. Loot the people: the Goa model for "ease of business"? READ NEXT >> Loot the people: the Goa model for "ease of business"?